Rabbi Gary Glickstein gives an overview of the history of PACT at our 30th Year Anniversary Celebration. A brief overview of who we are from Rev. Robert Brooks and Doris Hernandez. PACT leaders meet with Commissioner Daniela Levine-Cava about a potential Municipal ID program. Rabbi Robert Davis addresses the crowd at PACT's Annual Meeting in 2017 - "Let Justice Roll!" Nearly 1500 community members gathered at Notre Dame D'Haiti Catholic Church for PACT's largest assembly, the Nehemiah Action, in March of 2018. In 2014, PACT began working to get Miami Dade County to reactivate the Affordable Housing Trust Fund. In 2007, Miami-Dade County enacted this best practice program, but for eight years the Program was dormant, Trustees not appointed and funding not provided. Because of our work, the fund was reactivated, half of all funding has been dedicated to families making 50% of area median income, and a Board of Trustees has been appointed. Since we began working on this, the amount of money in the Trust Fund increased to from ~$1 million to $6.3 million. We are continuing to work until there is a sustainable, annual source of $10 million for the Trust Fund. Miami-Dade has been among the top three counties with the most cost-burdened renters every year since 2007. In order to solve this crisis, we need an aggressive plan of action that includes rigorous accountability measures. 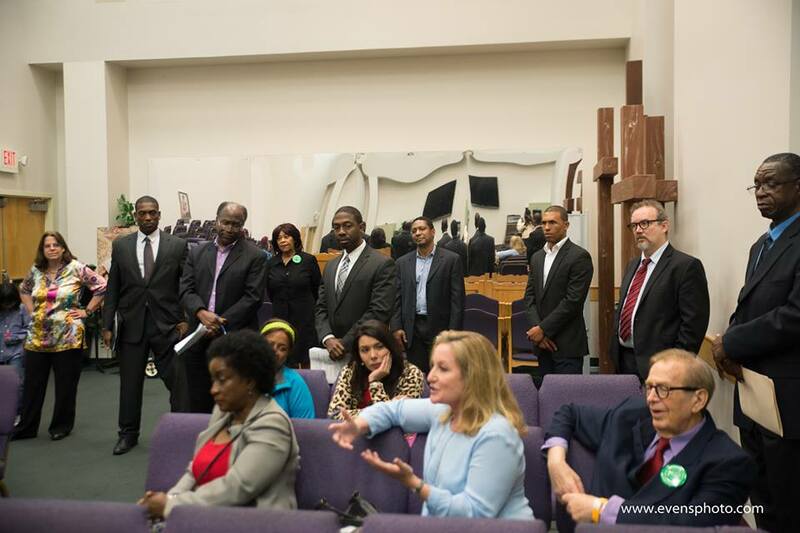 Therefore, at our 2018 Nehemiah Action, we gathered with nearly 1500 community members and asked Mayor Francis Suarez to spearhead the creation of a 5-year plan for affordable housing in the City of Miami. This was in follow up to posing the same question to County Mayor Carlos Gimenez in 2017. Because of our power in numbers, they both agreed. Now, the City of Miami is working with Miami Homes for All, FIU, and other partners to complete a 5-year plan by 2019. The County is also set to begin its 5-year planning process within the coming months. PACT voted to begin working on "Immigration" in October of 2018. We heard many stories from our membership about immigrants not having access to necessary services and being arrested and detained because of minor incidents. After a few months of research, we decided to focus on 1) creating a communal or municipal ID program here in Miami-Dade County, and 2) lowering the number of people being arrested and detained for minor offenses (like driving without a license). We are currently meeting with various public officials and allies to move these issues forward. After 5 years of working diligently alongside nine sister organizations throughout the state of Florida, we were able to get a bill passed in the Florida legislature that makes Civil Citations the default for juveniles rather than arrests. Civil Citations connect children to diversion services for non-violent offenses, rather than branding them with an arrest record. Because of our work, there are now 5,000 fewer children being arrested across the state of Florida! Unlike an arrest, the Civil Citation Program reduces recidivism, saves more than $4,500 per case, and sanctions youth without giving them a criminal record. PACT found that when youth receive a criminal record without the opportunity to correct behavior, they are likely to get arrested again for more serious offenses and often lose access to college scholarships, military opportunity, and housing. After hearing dozens of stories about acts of violence involving guns in the neighborhoods in which our congregations are located, PACT members voted to work on gun violence in October of 2016. Through our research process we discovered that the vast majority of incidents of gun violence are perpetrated by about 0.01% of the population in the area in which the violence took place. Most of the people committing these crimes are not the targets of the resources and programming that our County has dedicated to preventing gun violence. These resources are typically focused on children, and yet the majority of victims of gun violence are young men ages 18-24. In response to this information, PACT brought together leadership from the Miami-Dade Police Department, the Miami Gardens Police Department, the State Attorney's Office, the City of Miami Gardens, and the Public Defender at our largest assembly of the year in March 2017. In front of 1400 people, we asked this group to commit to jointly researching 3 proven gun violence intervention programs that we selected. We asked them to choose the one that fits Miami-Dade the best, find funding, and implement it. These leaders chose Group Violence Intervention (GVI). They have attended a training at John Jay College in New York City, appointed a steering committee, and allocated funding in the County budget and the City of Miami Gardens budget. The program should be off the ground within the coming months. PACT will train 500 community leaders this year to engage their community, identify community problems, research solutions, and negotiate with officials. All of PACT's work is led by grassroots community members. Our leadership training this year includes 7 local training opportunities as well as 4 national training opportunities in conjunction with our partner organizations throughout the southeast.